Gold Award recipients recognize the power of being a Girl Scout. We have an exciting year ahead! Throughout 2016, we will celebrate the 100th Anniversary of Girl Scouting’s top award, the Girl Scout Gold Award. Across our Movement and over the years, millions of alumnae have earned the Golden Eagle of Merit, the Golden Eaglet, the Curved Bar, First Class and the Gold Award. Over one hundred of our girl members are currently working to attain the Girl Scout Gold Award. During this centennial year, we will focus on the many benefits of earning the Girl Scout Gold Award. According to the GSRI study Girl Scouting Works: The Alumnae Impact Study (2012), Girl Scout Gold Award recipients reap greater benefit from their time and experiences in Girl Scouting than non-alumnae. Comparatively, these individuals display more positive life outcomes pertaining to sense of self, life satisfaction, leadership, life success, community service, and civic engagement. Girl Scout Gold Award recipients represent our most successful and engaged—and happiest—Girl Scout alumnae. They have positive attitudes toward Girl Scouts, including how it has shaped their lives. 99 % say that belonging to Girl Scouts has had a positive impact on their lives. 92 % say that some of the experiences they had in Girl Scouts could not have occurred anywhere else. 92 % say they are proud to have been a member of Girl Scouts. 91 % say that Girl Scouts played an important role in their childhood. 90 % attribute their success in life to Girl Scouts. 96 % attribute Girl Scouts with encouraging the setting of high goals and aspirations in life. 96 % attribute Girl Scouts with providing leadership opportunities they couldn’t get elsewhere. 91 % attribute Girl Scouts with making them a more responsible member of their community. 90 % attribute Girl Scouts with providing them with an adult role model. 93 % attribute Girl Scouts with enabling them to feel empowered. GSNC has hundreds of community partners, including every public school district, most private and religious schools, local colleges and universities, other not-for-profit organizations, as well as government and corporate supporters and many small businesses. This is the second in a series of articles that will focus on some of our partner organizations. For more than a decade, DHL has partnered with the Girl Scouts of Nassau County to ship 600,000 boxes of Girl Scout Cookies—that adds up to literally ten million cookies!— to service men and women across the world through Operation Cookie. A worldwide leader in shipping and logistics, DHL has made social responsibility a key piece of its strategy. By leveraging its core competency—international shipping—DHL makes an impact across the globe by connecting people and coordinating the smooth delivery of innumerable products across air, land and sea. From species-survival programs (delicately shipping endangered species to new homes for their protection) to sending a taste of home (like cookies!) to troops stationed in the Middle East during Girl Scout Cookie Season. DHL has made itself a pillar of the community and an indispensable resource for organizations such as the Girl Scouts. While this partnership, at the center of Operation Cookie, began 11 years ago, DHL began its own Operation Holiday Cheer one year prior. Sending Christmas trees, menorahs and holiday decorations to troops stationed overseas, Operation Holiday Cheer has been an annual community event for 12 years, most recently celebrated on December 7, 2015. But it was Connie W., a GSNC volunteer from Manhasset, who lit the spark that brought the two organizations together for something special. Connie and her family had been shipping hundreds of boxes of cookies directly to troops out of her garage. When a friend made the connection between DHL’s commitment to community involvement and GSNC’s desire to send cookies around the world, all it took was one question to make it all happen: Can we do this? The answer has been a resounding yes! From Iraq, Afghanistan, Bahrain and Kuwait to Germany, South Korea and everywhere in between, the program has grown exponentially and organically. Individual Girl Scouts mentioned that their own family and friends are stationed outside the Middle East, and the program responded accordingly. With DHL’s logistical ability it was second nature to grow the program and bring a fresh box of Do-si-dos or Thin Mints to troops at military hospitals such as the Landstuhl Regional Medical Center in Kaiserslautern, Germany and troops stationed around the world. And that social responsibility continues to get paid forward. The late Lt. Col. Schumacher had asked if he could share his Girl Scout cookies with the children in Iraqi villages his troops encountered every day. While the troops were thousands of miles away from home, sharing a taste of their childhood with a smiling face helped bring together two cultures in a truly special way. That genuine respect, love and appreciation is what Operation Cookie is all about. 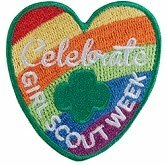 Girl Scout Week is celebrated each March. It starts with Girl Scout Sunday and ends with Girl Scout Sabbath on a Saturday. It always includes the Girl Scout Birthday, March 12th, the day in 1912 when Juliette Gordon Low officially registered the first 18 girl members in Savannah, Georgia. Don’t let the week pass without earning your Girl Scout Week patch and learning so much more along the way! Let's Celebrate! All Day! All Week! Commemorate this special week by taking the challenge! Complete at least one activity from each day of the Girl Scout Week calendar. Learn more about the Girl Scout Week Calendar. Connecting Girl Scouts with their FaithsThe 104th Birthday of Girl Scouting (March 12th) begins with Girl Scout Sunday on Sunday, March 6th and ends with Girl Scout Sabbath/Shabbat on Saturday, March 12th. What better time to review the ways we can link Girl Scouts with their Faiths. Learn how Girl Scouts can connect with their Faiths. Come celebrate Girl Scout’s 104th Birthday with our Special Girl Scout Week Promotion. Beginning March 7, 2016 the first 104 customers to make an in-store purchase (minimum purchase of $5 to qualify) at the GSNC Shop will receive a FREE GSNC luggage tag. When you there, don't forget to pick up all of your Girl Scout Week necessities including your Girl Scout Sunday Patch, Girl Scout Shabbat Patch, Girl Scout Sabbath Patch, and your Girl Scout Week Patch. Every day on social media, Girl Scouts are showcasing amazing Take Action projects, exciting Troop adventures and memorable Girl Scout moments. Are you one of those Girl Scouts? Next time you post, try including a Girl Scout hashtag(#) in your post so you can be part of the bigger Girl Scout conversation. #GirlScoutsGiveBack – use when posting pictures or talking about your Girl Scouts giving back to the community through community service projects or Take Action Projects. #GirlScoutsRock – use when posting pictures or talking about Girl Scouts Awesomeness… anything that involves fun, friends and making a difference, this is the hashtag to use. #GirlScoutsForever - use when posting pictures or talking about your Girl Scout sisters and the memories you’ve made. #BlingyourBooth – Is your Troop taking part in the Bling Your Booth contest? Be sure to use this hashtag to show others what your Blinged-out Cookie Booth looks like. #CookieBoss - Showcase your Girl Scout learning the #5skills, selling Girl Scout Cookies and being an all around #CookieBoss with the #CookieBoss hashtag. National Girl Scout Cookie Weekend is February 26th-28th! Girl Scouts and Non-Girl Scouts alike can join in on the fun and festivities on National Girl Scout Cookie Day! Girl Scouts can celebrate with us by hosting a Cookie Booth Sale, a Cookie Walkabout, or simply going door-to-door that day with your Girl Scout Cookie Order Form. Not a Girl Scout, well you can still participate in the day’s festivities. When Girl Scouts sell Girl Scout Cookies®, they are building practical life skills such as Goal Setting, Decision Making, Money Management, People Skills and Business Ethics… skills that will help them be successful in life and become the leaders of tomorrow! Hold a Cookie Booth Sale- a booth sale is when a Troop sets up a table or booth at a public location and displays and sells boxes of cookies directly to customers, allowing them to eat Girl Scout Cookies right away. So get out there and bling your booth! And, to make your booth sale even more fun, join the Bling Your Booth Challenge (click for details). Go door-to-door with your Girl Scout Cookie Order Form - Ask your neighbors if they purchased all of their Girl Scout Cookies? Call your relatives and tell them about your goals for the Girl Scout Cookie Program. Educate your teachers about all that you learn by selling Girl Scout Cookies. They might want #OneMoreBox! Get Digital. Take some time to send an email reminding your past cookie buyers that Girl Scout Cookies are only available for purchase through April 4th (that's only a little more than 1 month away). And, for those customers who have already purchased Girl Scout Cookies from you, take the time to send them a Thank You email. Get Social- If you have Facebook or Twitter account, post about Girl Scout Cookies and your National Girl Scout Cookie Weekend Festivities… be sure to be part of the conversation by including #CookieBoss and/or #GSCookieGram in your Tweets and posts and of course tagging us on Twitter @GSNC or on Facebook at Girl Scouts of Nassau County. --And it is fine if parents want to help this promotion for their daughter ... just ask for her input on what you should say and what artwork/photo to include. Are you looking to find Girl Scout Cookies? Download our new Girl Scout Cookie iPhone or Android app to find Girl Scout Cookies in your area or visit www.girlscoutcookies.org. 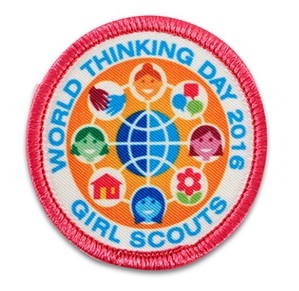 World Thinking Day 2016 is February 22. Earn your World Thinking Day Award by exploring this year’s theme, “Connect!” Girl Scouts of all ages can participate in World Thinking Day. Checkout the list of activities by grade level. Come down to the GSNC Shop and join us for our World Thinking Day Scavenger Hunt.Those who complete the scavenger hunt will receive a special gift. Now through February 22nd. Play the World Pin Relay Game.